Since I started doing music, photography and other arts in which I’m interested, when I asked some people for advice at the start, the typical answer was “draw/listen/copy/play someting you like”. I think that trying to imitate a reference artist can be useful and motivating in the beginning to learn some technique, but what happens when all your education is based on learning that way? Learning classical piano for example, the common denominator of most schools is that they teach you how to read sheet music gradually, to be able to play more and more dificult songs, songs which most of them were composed two hundred years ago, isn’t there any good classical piano composers at present? 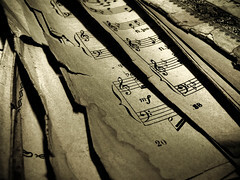 Things are quite different in modern music styles like Jazz or Blues, where an significant part of the song isn’t in the paper but in the artist, this forces the interpreter to contribute with a personal expression to the song. Due to this “extra” effort we do have some brilliant Jazz musicians at present, Brad Mehldau for example. I don’t pretend to say that modern styles are for most talented musicians, I just think that some existing (and extended) teaching methods don’t maximize the creative abilities of the artist. This has happened to me for example, when I try to create a new song, half of the time I have an idea I’ve thought “Cool! Wait a minute…”, and then I realise that that melody was from a soundtrack I listened a year ago. Is it really valuable having listened and learned to all that songs or technique when talking about creating something new? I think it happens the same with photography. In my opinion is like wanting to build a castle with those wooden pieces games, if you have the pieces in front of you, you will build only with that pieces, but if you start with no pieces but you still want to build the castle, you’ll find something to replace them, don’t be afraid of not having the proper education or knowledge about an art, because in my opinion all of that is less important than curiosity and attitude. What is also interesting is that if you can play a Rachmaninoff concerto you’re a genius, but if you draw a copy of a Monet’s painting, this is not so amazing at the eyes of another artist, to be euphemistic, so innovation is more or less important depending on the art we’re talking about, and I’m not sure if this makes any sense. This entry was posted in Ideas and tagged art, arte, attitude, consume, create, creatividad, creativity, idea, innovate, music, musica, sheet, teaching. Bookmark the permalink.